Help keep our programming free by making a tax-deductible donation. 100% of your donation goes to running our program. You can make a donation right here by clicking the button and entering your credit or debit card information. If you’re on the Venmo app, you can make a donation there. You can find us on Venmo @bbpboathouse. Bring your checks, bills or change with you when you come kayaking! We’ve got a donation box at our waiver station. 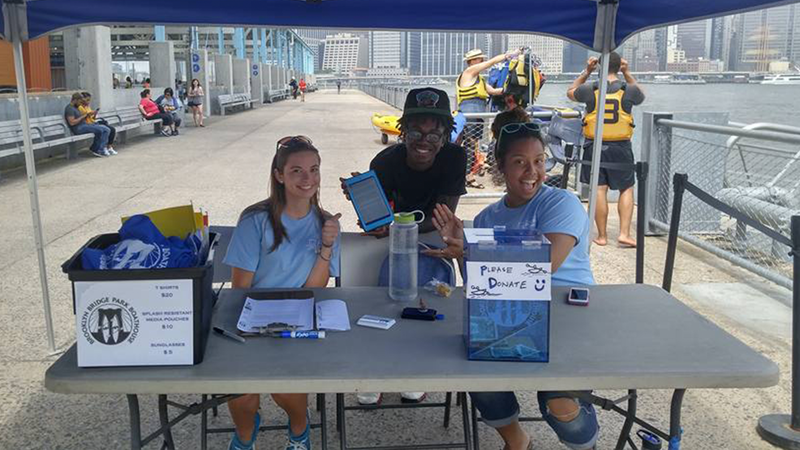 Did you know that shopping on Amazon supports the Brooklyn Bridge Park Boathouse? Amazon Smile donates a portion of their profits from your purchases to organizations like us. All you have to do is make sure you shop at smile.amazon.com and list the Brooklyn Bridge Park Boathouse as the non-profit organization you’d like to support. Private paddles are great ways for groups to enjoy kayaking together outside of our free public hours. They can be setup as casual kayaking in our embayment or as a friendly game of kayak polo at the Pier 4 beach. They’re great for team building or corporate social events. We can tailor a private paddle to the size and needs of your group and every private paddle includes time for kayaking instruction, equipment and on-water safety boaters. Send us an email at hello@bbpboathouse.org if you’re interested in setting up a private paddle.